I used to be intimidated by orchids. Any flower that looked that fragile had to be difficult to care for, tricky to work with and expensive to purchase. My thinking was changed when I studied floral design at the Canadian Institute for Floral Design (http://www.proflorists.net) last spring where we used orchids for many types of arrangements. Although delicate, this flower is long lasting and easy to work with. As you can see from my arrangements for this blog, a little goes a long way and even the simplest design is a show stopper when using the orchid as the main flower. The orchid family is one of the largest and most diverse of the flowering plant families with almost 30,000 species and about 800 new species added each year. They grow in nearly every climate with the exception of deserts and glaciers and have been discovered growing on every continent but Antarctica. The greatest number of orchid species is found in tropical regions and many of these orchids are epiphytes (they are attached to another living plant). Although there are some orchid species whose flowers are edible, there is one orchid species – Vanilla orchid – that is an essential source to a very popular baking ingredient. The seeds and pulp within the seed pod of the Vanilla orchid, which is native to Mexico, are used to make vanilla extract. The most common orchids are Dendrobium, Cymbidium, Phalaenopsis, Vanda and Cattleya. Dendrobiums are often used in cut arrangements, Cymbidiums are the classic corsage flower, Cattleya is popular for bridal work and Phalaenopsis (or Butterfly) is found in modern designs because of their simplicity and elegance. This graceful flower represents love, luxury, beauty and strength, refinement, many children, thoughtfulness and mature charm. This is a very simple and elegant arrangement. 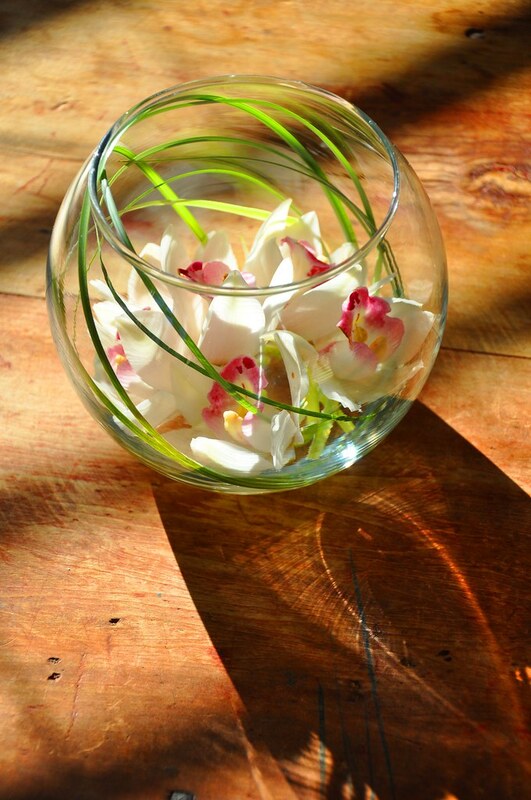 Although orchids are expensive, with a little care they will last for a long time. The arrangement I made for this blog lasted for almost 3 weeks. Put about 1 inch of treated water into rose bowl. Roll the bear grass around your fist to make a tight coil. Put your hand into bowl and let go of the bear grass coil. The grass will spring open in a nice ark inside the bowl. This entry was posted in Floral Arrangement, Floral Design, January and tagged cymbidium orchids, floral design, Flower, Orchid, orchid family. Bookmark the permalink. Both comments and trackbacks are currently closed. 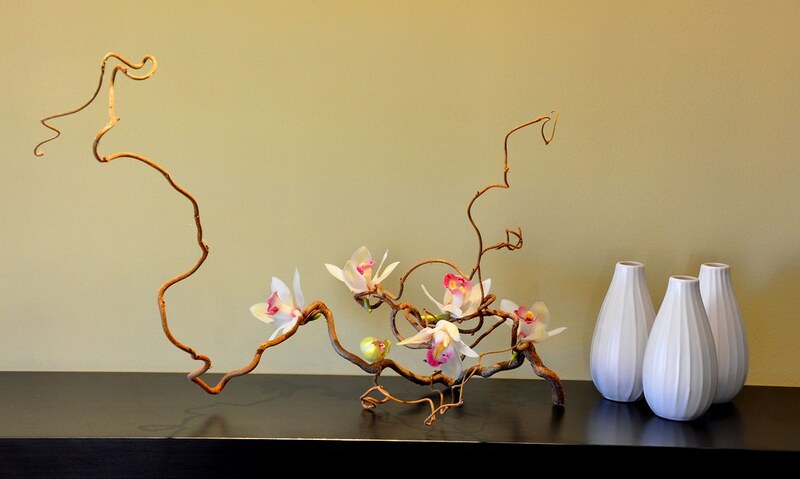 Orchids have always been one of my favorites…simple yet extravagant at the same time! Nice work Liz!! !